Can Pendergast dance with a partner? After an overhaul at the FBI's New York field office, Special Agent A.X.L. Pendergast is forced to accept an unthinkable condition of employment: The famously rogue agent must work with a partner. 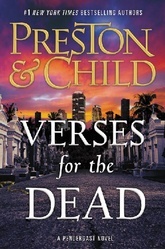 Pendergast and junior agent Coldmoon are assigned to Miami Beach, where a rash of killings are distinguished by a confounding MO: The bloodthirsty psychopath cuts out the hearts of his victims and leaves them—along with cryptic handwritten letters—at the gravestones of women who committed suicide. But the seeming lack of connection between the old suicides and the new murders is the least of Pendergast's worries, because the brutal new crimes may be just the tip of the iceberg: a conspiracy of death that reaches back decades.